CFO Andrew Levy, hired to help the embattled $19 bln airline in dogfights with cheaper rivals. is leaving after less than two years. As its chairman also takes off, United looks less able than peers to combat rising oil prices and seat capacity hitting margins. Time to buckle up. 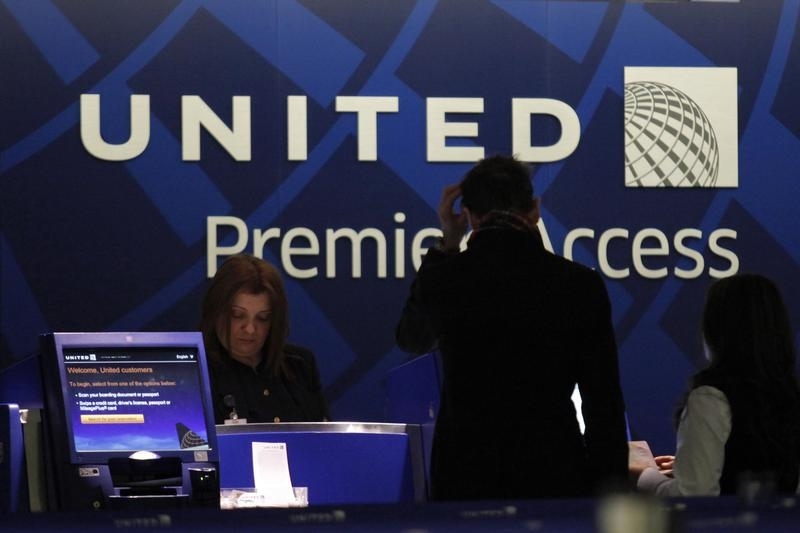 A worker from United attends to some customers during their check in process at Newark International airport in New Jersey , November 15, 2012. Andrew Levy is stepping down as chief financial officer of United Airlines after less than two years in the role, the company said on May 17. Gerry Laderman, who is currently senior vice president of finance and procurement and treasurer, is taking over as interim CFO. Levy joined United in August 2016 after spending 13 years at Allegiant Travel, an ultralow-cost carrier. Levy said he plans to return to entrepreneurial pursuits, according to a letter he wrote to colleagues, cited by Bloomberg. In April, airline-industry veteran Robert Milton said he was stepping down as chairman, a role he held for two years.